Sociology professor and Director of the Science and Justice Research Center Jenny Reardon talks about how genomics engages some of the most fundamental questions of knowledge and justice of our times. "How you interpret information is going to be framed by the values you hold and what your goals are as a collective society," said UC Santa Cruz sociologist Jenny Reardon about what we do with large amounts of biodata. 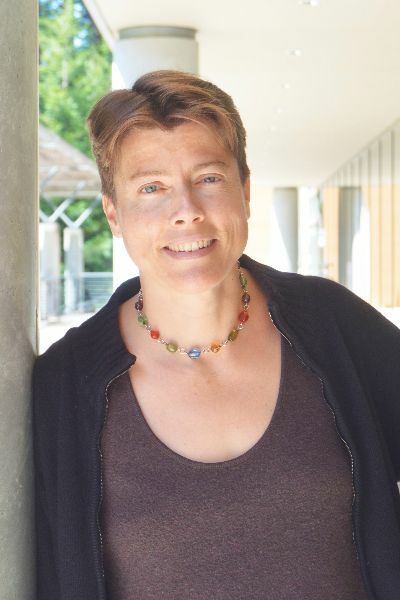 When scientists began sequencing the human genome in the 1990s, UC Santa Cruz sociologist Jenny Reardon was an undergraduate student studying biology at the University of Kansas. The budding scientist became curious about the social implications of this transformative new research. She started asking daring but critical questions: how will the biological information be used, and where, how, and most critically: by and for whom? Since then, Reardon has sought to understand what the deluge of genomic information means to people, populations, and society. She continues to explore the transformative impact of the human genome in science and society in her new book, The Postgenomic Condition: Ethics, Justice, and Knowledge after the Genome (University of Chicago Press, 2017). After graduating from the University of Kansas in 1993 with degrees in political science and biology, and working for a year as a researcher in a molecular evolution laboratory at UC Davis’ Bodega Marine Laboratory, Reardon pivoted firmly into the social sciences. She completed her Ph.D. in Science and Technology Studies at Cornell University in 2002, two years after President Clinton and leading genome researchers announced a complete first draft of the Human Genome Project. But to the tenacious scholar it felt anything but. The expanding field led Reardon to ask more questions and address new concerns. In 2005, she authored Race to the Finish Identity and Governance in an Age of Genomics (Princeton University Press), a book that critically examined how the new genomics was reshaping longstanding debates about the proper uses and meanings of racial categories. In the 2011-12 academic year, Reardon co-founded the Science and Justice Research Center with Karen Barad, a professor in the feminist studies, philosophy, and history of consciousness programs at UC Santa Cruz. Under Reardon’s leadership, the center has hosted a range of events about genomics and society, including a conference about big data in the age of precision medicine. Reardon continues to serve as its director. In the following interview, Reardon talked about her new book and shared insights on how genomics engages some of the most fundamental questions of knowledge and justice of our times. What was your motivation to write The Postgenomic Condition: Ethics, Justice, and Knowledge after the Genome? Jenny Reardon (JR): After I finished writing Race to the Finish Identity and Governance in an Age of Genomics– a book about a project that was widely criticized for being racist and biocolonialist–I wondered what could we do to make things better. If genomics is running into all these social and ethical issues, how could it do a better job of responding to those issues in its daily practices? All of the cases in the book were chosen because I found something in them that was inspiring in terms of trying to make a genomics that would truly benefit people. That's what brought about The Postgenomic Condition: Ethics, Justice, and Knowledge after the Genome. And at first there was going to be no book. The idea was to contribute to change. I was actually somewhat insistent that I was not writing a book, that what I was trying to do was help forge practices that would create a genomics that could better respond to the people it was supposed to help. What is the postgenomic condition? JR: The Postgenomic Condition is a riff on Hannah Arendt’sThe Human Condition, and Lyotard’s, The Postmodern Condition. Both Arendt and Lyotard wrote in the wake of developments crucial to the emergence of human genomics as a field of study: Arendt, in 1958, five years after the report of the molecular structure of DNA; Lyotard in 1979, in the wake of the creation of mainframe computers and two years after the sale of the first personal computers. Both raised concerns about the effects the rise of informatics and mathematics—which accompanied the rise of molecular biology and computers—would have on knowledge and politics. Both were worried about the effects of these major developments on our ability to think and speak about that which we do–which is an Arendtian way of putting things–and or our ability to govern ourselves. I felt that Arendt and Lyotard provided frameworks that were helpful for understanding what's going on today in genomics. What does all of this genomic data mean? How do we speak about that which we are doing in this domain? Specifically, Arendt worried about the rise of mathematics and physics after World War II. We had a bunch of people with power and respect who were good at algorithms and mathematical symbolic language but who could not translate that tech talk into speech that could be widely understood. The effects of this persist. I wanted to write a book to invite people in to the discussions about genomics and to help them engage with the issues brought by high tech science. So, The Postgenomic Condition taps into that spirit, that 'speaking that which we do' that Arendt brought to us. So that's what the title was about. Your work looks at how we must engage fundamental questions of knowledge and justice in genomics. Why does genomics need to be considered from a social justice perspective? JR: A justice framework makes sense because the genome raises fundamental questions about how to live collectively. One of the big points I make in the book is that liberal democratic principles–like property and participation and inclusion–reach their limits in genomics. If people were worried about genomics being racist, then early in the twenty-first century researchers attempted to address that by saying: “We are going to include all people in genomics.” But it turned out that a lot of people didn't want to be included. They believed that genomics would not help them, and might even hurt them. “We don't have access to basic healthcare. Why would we want to be included in genomics research when there is no hospital in our community?” This is what I was told in Tuskegee, Alabama. Inclusion, they made clear, did not address the more fundamental issues of access and justice. People often invoke the cause of justice when they feel the state is not adequately representing them, and when they feel that the whole system, while it may be lawful, is unjust. Genomics frequently evokes this feeling, partly because of the amount of money at stake. There are some famous cases. For example, when a University of California professor took tissue from his patient John Moore, and created a cell line that made hundreds of thousands of dollars, Moore was told by the courts that he had no property interest in his cells. And as another example, consider Henrietta Lacks. Many millions of dollars–even billions–have been exchanged for access to her cell line yet her family continues to live in poverty. The courts may deems this legal, but many question whether it is just. What are some of the biggest challenges and opportunities you see in medicine today? JR: When it comes to genomics, it is about figuring out what genomic data means for how people care for themselves. There are a lot of questions about how in practice anybody is going to interpret this information. Only in rare cases–such as in the case of some hereditary breast cancers--is the link between genomic information and medical outcomes clear. Over the holidays this year there was a big push–you might have heard it on NPR–23andme was advertising: “Give the gift of genetic information.” As a result, doctors have seen a big uptick in their patients contacting them saying "Hey, I got this report from 23andme, what does it mean?" Is that a good use of limited resources in the medical system to be trying to help people who on their own through a consumer technology bring this information to their doctors? Often the doctors don't know what this so-called information means, and that often is because the biomedical community doesn't know what it means yet. One of the points I make in the book is that one reason for this is that early on in the Human Genome Project the decision was made to not build the apparatus needed to interpret the sequence. Instead the Human Genome Project’s only goal was to sequence the DNA. The interpretation, they decided, would come later. As a result, we have a system that is very good at producing genetic information but now must work to figure out how to interpret it. You say that we must learn to connect in new ways to build a genomics that benefits more—and more diverse—people around the globe. What does that look like? JR: It means from the very beginning of genomics projects we need to be doing what didn't happen during the genome project era: we need to integrate in the apparatus for interpreting the information. Interpretation is not merely a technical issue. Interpretation is also a humanistic project, it is a social project. How you interpret information is going to be framed by the values you hold and what your goals are as a collective society. It requires hybrid expertise, the institutional capacity to work across historic divisions. And it requires learning how to listen to really different voices. This is one of the goals of the book: to put the reader in touch with the stories of people that they would not normally hear. Something that was very important to me in the writing of the book was to tell stories that bring us together across our differences–to create the ability to hear what a person in Tuskegee, Alabama or Edinburgh, Scotland who is not a genome researcher might say about the meaning and value of genomics. We hear a lot from the scientists and from the creators of these technologies about what genomics is and what it means. But what about the people who are actually asked to use and engage with this information? We need to find a way to listen to those voices and act upon their insights.